Do you like your reading in bite-size chunks? Have you heard about Milo's latest novel, in serial form? Don't delay – Subscribe today! Captain Quasar is out of time. . . Pursued by vengeful Goobalob toll collectors, savage Arachnoid bounty hunters, and formidable Amazonians, Captain Bartholomew Quasar must do whatever he can to keep the crew of the Effervescent Magnitude out of harm's way. All in a day's work—except time is not on his side. Join the crew of the Effervescent Magnitude for a hilarious time-travel space adventure the likes of which you've never seen! Jaw muscle twitching at untimed intervals, Captain Bartholomew Quasar gripped the armrests of his deluxe-model captain's chair and narrowed his heroic gaze. The main viewscreen on the bridge of the Effervescent Magnitude radiated with white-hot streaks blurring in elongated trajectories as his star cruiser plunged into the depths of space at something near the speed of light. This was the Magnitude's maiden voyage into deep space utilizing the recently installed cold fusion near-lightspeed reactor—an experimental propulsion system they'd picked up on the planet Carpethria. One thing was readily apparent: it worked. But how long could the ship could maintain this incredible velocity without compromising hull integrity? The Magnitude's first officer, Commander Selene Wan, wasn't keen on the idea of allowing a Carpethrian to man the helm of their freshly minted star cruiser. But no one else on board knew how to navigate at near-lightspeed, and it took all four of the alien's hands to do the job—something two humans would have had to coordinate in tandem. And that could have gotten awkward. "Steady as she goes." Quasar smoothed down his close-cropped blond hair and cringed as the ship released a moan that didn't sound good at all—something akin to a whale giving birth. "How are we doing, Hank?" "Haven't run into anything yet," grunted the very hairy helmsman, hands flying across the controls. "Status report?" Quasar half-turned to regard his first officer with a confidently raised eyebrow. Commander Wan, a tall, slim Eurasian with impeccable posture, kept her attention riveted on her console. "Proximity scanners are offline." She swayed on her feet with the rocking movements of the ship, her sleek black hair swinging across her shoulders. "Artificial gravity is holding. Life support remains functional." A sudden frown creased her usually furrow-free forehead. "But the reactor, sir… We may have a serious problem." "It's overheating, Captain. If we don't decelerate, it may—" She swallowed. "Explode." That wouldn't be good at all. The folks back home were depending on Captain Quasar and company to bring back loads of quartz necessary for virtually every form of technology and transportation on Earth, not to mention haute vintage time pieces. The Magnitude could not possibly be allowed to blow up. "Hank?" Quasar faced the shaggy helmsman. "Could we possibly slow down a bit?" The Carpethrian grunted something intelligible, followed by, "Commencing deceleration sequence." "Very good." The captain nodded, glancing over his shoulder at his first officer. Everything was under control. "Status?" "Uh-Hank? About that deceleration sequence…" Quasar cleared his throat. "It will take thirty minutes, Captain. Any sudden downshift in speed would tear the ship apart." Quasar maintained a brave façade for the sake of his crew. Such was expected from starship captains, after all. Clenching his jaw, he leaned toward Wan and whispered, "Do we have thirty minutes?" Now Available from Every Day Novels. Add Captain Quasar to your Goodreads bookshelf or add it to your TBR list. 1. When did you start seriously pursuing writing as a career? I've been writing since I was 12, but I started submitting my work for publication in the summer of 2009. I'd always thought I would pursue publication at some point—probably after I retired from teaching or turned 40. My first story was published in January 2010, and I've had over a hundred others accepted for publication since then. I won't turn 40 for another year, and I'm still teaching full-time. Doesn't look like I'll be retiring anytime soon! 2. 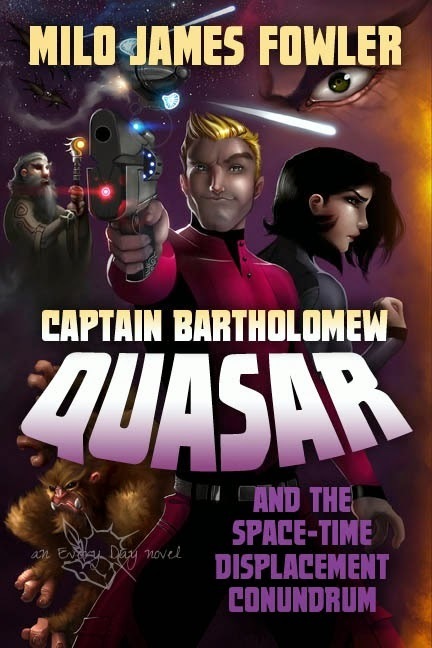 How did you create the character Bartholomew Quasar? 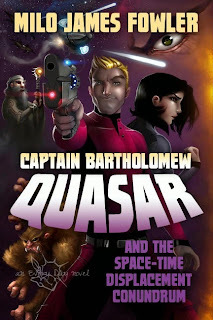 When I came up with Captain Bartholomew Quasar back in the spring of 2010, I was going for a mash-up between William Shatner's James T. Kirk and Dudley Do-Right from the Rocky and Bullwinkle Show (but in Quasar's case, things seldom ever go right). He's one of those classic pulp heroes with a heart of gold whose narcissistic tendencies often land him in hot water. I hope readers can laugh at Bartholomew Quasar and root for him at the same time. He's ridiculous, but there's something about his fallible nature that most of us can relate to on some level. 3. Are you working on more Captain Quasar stories? I've written over 20 Captain Quasar tales so far, many of which are out on the submission circuit, looking for good homes. "Captain Quasar and the Ghosts of Space Command" will be published in the next issue of Perihelion Science Fiction. "Captain Quasar and the Carpethrian Call of the Wild" will be included in the B is for Broken anthology, and "Captain Quasar and the Devious Powers of Persuasion" will be in the Geminid Press space opera anthology. I'm in the middle of edits on a novella-length adventure I plan to submit for publication soon. My collection of 15 Quasar tales Starfaring Adentures…in SPACE is available everywhere eBooks are sold—and free for the taking, last time I checked. 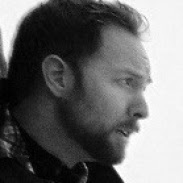 Milo James Fowler is a teacher by day, speculative fictioneer by night, and an active SFWA member. When he's not grading papers, he's imagining what the world might be like in a dozen alternate realities. In the past 5 years, his short fiction has appeared in more than 100 publications, including AE SciFi, Cosmos, Daily Science Fiction, Nature, Shimmer, and the Wastelands 2 anthology. Visit www.milojamesfowler.com and join The Crew for updates about new releases. Have you read any of Milo's novels? Do you like his detective noir, weird westerns, or science fiction best? Please leave a comment to let me know you were here, and I will respond. Thanks for dropping by, and don't forget to wish Milo Good Luck!! I might be able to get Milo to drop by for a few comments as well. My favourite is his detective noir work! Cross between Capt Kirk and Dudley, now that is hilarious!! This sounds like an awesome series. I put this on my want to read list Milo. Awesome to see you are ahead of schedule on accomplishing publication dreams. Wow, over a hundred published short stories. Super! Thanks for dropping by dolorah! That 100 stories proves Milo doesn't take no for an answer. I like the serial format idea too, Denise. Glad you dropped by. Thanks for the kind words, y'all -- and for the signal boost, DG! Anytime, Milo, it's my pleasure. I like the cover on this novel, and the serial format is something I'm interested in learning about. Good Luck! Glad you could drop by, Roland! Just finished a short story about Quasar. He's a fun character. I think so too, he reminds me of a Star Wars hero and his sidekick. . .! Every Day Novels is reinventing the serial for the 21st century. Mine is the third novel they've published; the other two were mystery and literary suspense. Plenty of variety. There's a new Captain Quasar tale published by Perihelion Science Fiction that you can read for free: "Ghosts of Space Command"
Cool character with a fun name, and I like that it's serialized. Back when we were going to sign with Random House they wanted us to serialize our zombie book. That program fell through, but I think more books should explore serialization. For the right story it's a great format, Mr. Quasar definitely included. A little of all formats - print, ebooks and serials would just be perfect. ...and with my novel, it will be all three: serialization through August, followed by an eBook and print release. It's going to be a fun ride. Dudley Dooright was a fun show. Congrats, Milo! Hope it's a huge success.